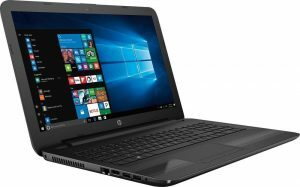 HP 15-AY103DX is a 2017 model mid-range laptop for work and play with a 15.6-inch touchscreen regular HD display, a very capable and energy efficient seventh generation Intel i5 processor, large storage, and memory. It comes with the ultra low voltage dual core Intel i5-7200U processor (3MB L3 cache) at 2.5 GHz speed up to 3.1GHz with turbo boost and hyperthreading with two cores handling four threads in parallel, the latest model 8GB DDR4 SDRAM to let you run a few things simultaneously, 1TB Serial ATA hard drive at 5400rpm rotating speed and the Windows 10 Home operating system. There is no Solid State Drive for storage on this model and you’re restricted to a regular 5400rpm HDD. But this is expected at the low price point and at least the storage size is very large at 1TB so you can save lots of photos, songs, and videos on the hard drive. 15.6-inch high definition LED-backlit TruBrite touch display has the 1366 x 768-pixel resolution and TN panel. So it doesn’t come with a Full HD screen with an IPS panel with very large viewing angles and much higher resolution and clearer pics. But normal HD is also adequate at this price level and seems to be clear overall with good contrast and vibrant colors. This not a gaming or an advanced multimedia machine, so it only includes the integrated Intel HD 620 graphics card that shares memory with the main CPU. It has a video card benchmark score of 942 at the time of this review, which places it in the mid-range GPU category. There is a high definition webcam on the top bezel with a reasonable picture quality and a microphone. Connectivity options include a DVD/CD Burner, 802.11 bgn wireless (no Bluetooth), Ethernet with RJ-45 connector, the latest version USB 3.1 port with data speeds of up to 10Gbps, 2 x USB 2.0 ports, an HDMI output, an integrated Multi-in-One Media Card Reader, and a Combo Microphone / Headphone connector. 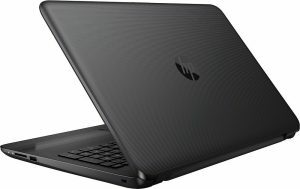 Black HP 15-AY-103DX has a solid matte plastic chassis, a regular but still sleek and modern laptop design, is just 0.95 inches thick (the exact measurements of 15.12 x 10.02 x 0.95 inches) and weighs 4.73 pounds. It has a regular design full-size non-backlit keyboard with a multi-touch trackpad with the right and left click buttons and a numeric pad on the side. The September 2016 release Kaby Lake Intel i5-7200U is a power efficient ultra low voltage processor with a typical Thermal Design Power of 15 watts. And it will help with a longer battery life from its weaker 31WHr battery, so you can expect around 4 hours of normal use. The Intel HD 620 combined with the Intel i5-7200U will offer you sufficient gaming performance for less demanding games and will also be fine with some of the advanced games at low settings and resolutions. You have a mid-range computer with a powerful and energy efficient processor, large amounts of storage and multitasking power for decent overall performance in your daily tasks. There is no Bluetooth and you’d need an adapter to use this feature. It comes with a built-in wireless connection but it is the 802.11bgn variety with good enough speed and coverage, not the latest faster 802.11ac. The screen has a touch functionality but has regular HD resolution and TN panel, not FHD with IPS panel. And the 1TB size hard drive offers plenty of storage space but has a spindle speed of 5400rpm, not 7200rpm. And you may want to consider installing an SSD if you want snappier performance overall, to start and shut down the computer faster and to open the files quickly. To sum up, you’re getting pretty good value for money overall, considering the high performance of i5 CPU and good size storage and RAM along with decent connectivity options. The small cons mentioned are to be expected at the lower price level.